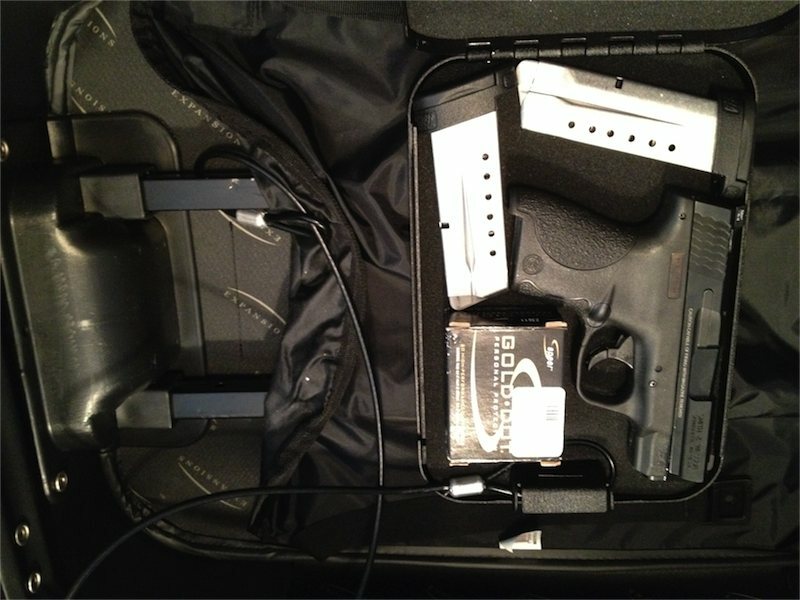 There has been quite a few people who are confused when it comes to traveling with your firearm by air. This post will review how you should pack your stuff. Ensure you review additional information about traveling by air to OpSpec Training classes near the end of this article. These are general rules and guidelines, that should not be construed as legal advice. If you are flying into our out of any of the airports around New York City (JFK, LaGuardia or Newark) all bets are off since the Port Authority and the district attorneys in the area may ignore federal law when it comes to your right to travel from place to place with a firearm. 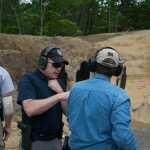 They occasionally will violate the Safe Passage Act of the Firearm Owners Protection Act. Before traveling, ensure you are legally able to posses and/or carry your firearm at your destination. For reference, you can visit and print out this page at the TSA website. 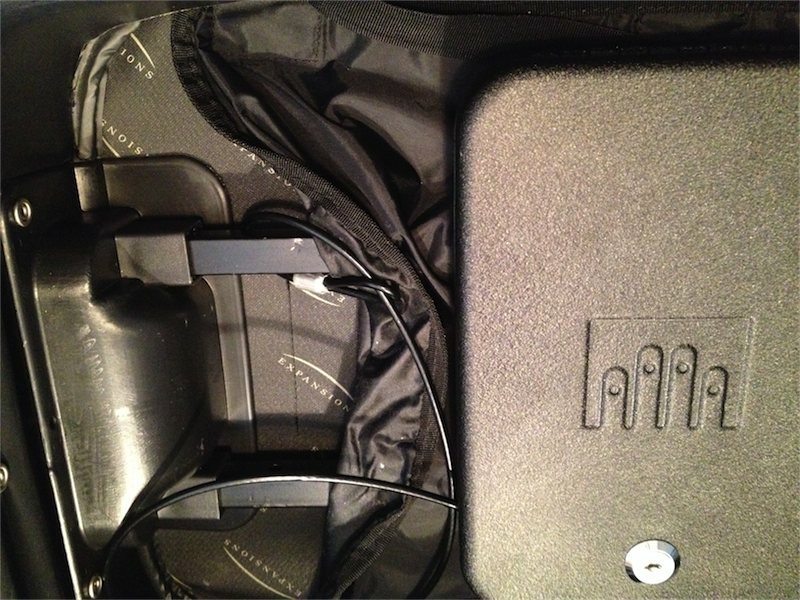 The case includes a cable that will allow you to string it through a bar within your luggage, and when you get to your destination you can use the cable to secure the case within your car or hotel room. Ensure your gun is unloaded. Although the TSA site says you can have magazines loaded, I’d suggest unloading the magazines and putting the ammunition into the original box it came in. 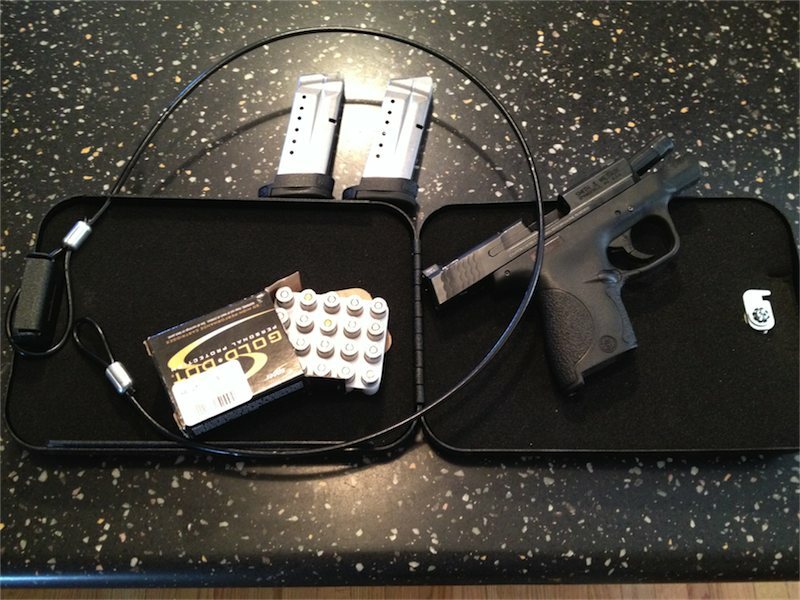 To make it easier during the X-Ray process, I do not insert a magazine even though it is unloaded. 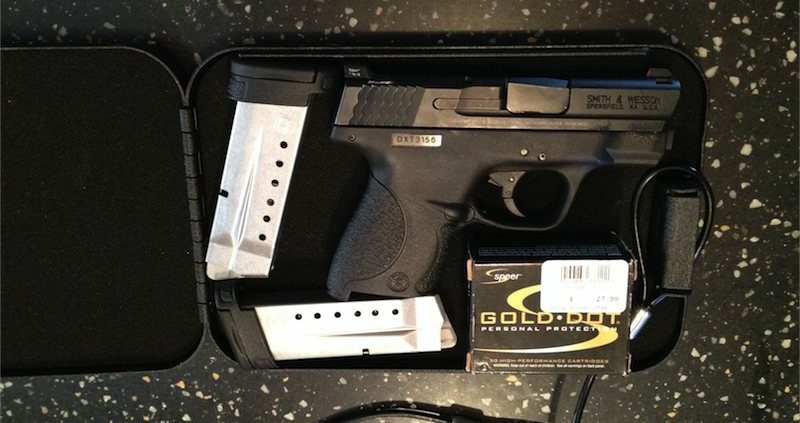 In my photo example, I’m using my go-to stuff … Speer Gold Dot hollow-point stuff banned by the Geneva Convention. ? Run the cable through an interior bar within the luggage. Most roller luggage have something inside to loop the cable around. This way, if an unscrupulous scumbag who works for the airline or airport is able to get into your luggage – TSA approved locks on the outside are a joke – opens your bag and tries to take the hard case, they would have to cut the steel cable to take the hard case. Hopefully they won’t have the time, and they will leave it. Simply let the agent know you need to declare a firearm. This is required. The form just requires your name and signature. It does not ask the make, model or serial number of any gun. You are declaring you have a unloaded firearm in your checked bag. It is unlikely an airline employee will want to inspect your gun to ensure it is unloaded. It is unlikely you’ll be asked to take it out and show that it is unloaded. The declaration form should be placed inside of your bag near your hard case with the firearm inside. Lock the outside of your bag – using one of those stupid TSA-approved locks – to slow thieves down a little bit and keep your valuables, hair conditioner and cool new sonic toothbrush safe. You should stick around near your bag during the screening process as the TSA might want to open up your bag to confirm the gun is unloaded. To speed the process along, you may want to run a short length of cable through the action and barrel to make it easier for some TSA agents to quickly determine it is unloaded. Don’t place a snap cap in the chamber. The only directive the TSA has at this point is to ensure the gun is unloaded, ammunition is properly packaged, and that the case can not be easily opened. If you can pry the case open and get a look-see inside of the case, it will not pass inspection. 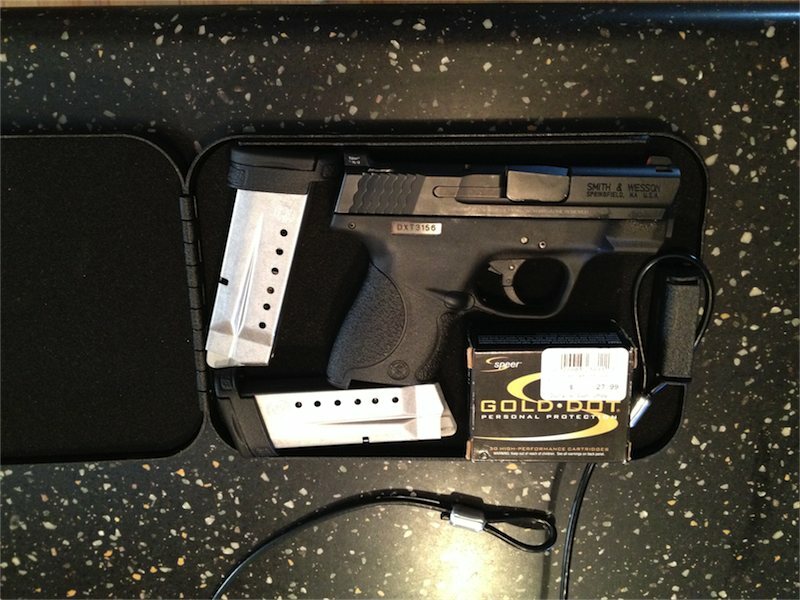 You absolutely should not use TSA-approved locks on the hard-sided case your gun is locked in. If the TSA wants to look inside, you must hand them the key – in person – and they must open the case in your presence to inspect it. Do not give them the key without being able to see what they are doing. Don’t let them go into some back room to open the case on their own. They can easily bring your bag back out to you and open it right then and there. Nothing is required when you are picking up your bag. One thing I always do is quickly open my bag to ensure the hard case is still there. If you’re traveling by air to an OpSpec Training class, we strongly suggest you have your ammunition shipped to the range or class host, or purchase the ammunition when you arrive on-site. Some ammunition sellers will drop-ship an order for you. Although airlines do allow some ammunition to be checked-in, it is unlikely hundreds or even thousands of rounds would be acceptable. You will need to follow the shippers policies concerning what service is required (overnight) when you ship a firearm to yourself.